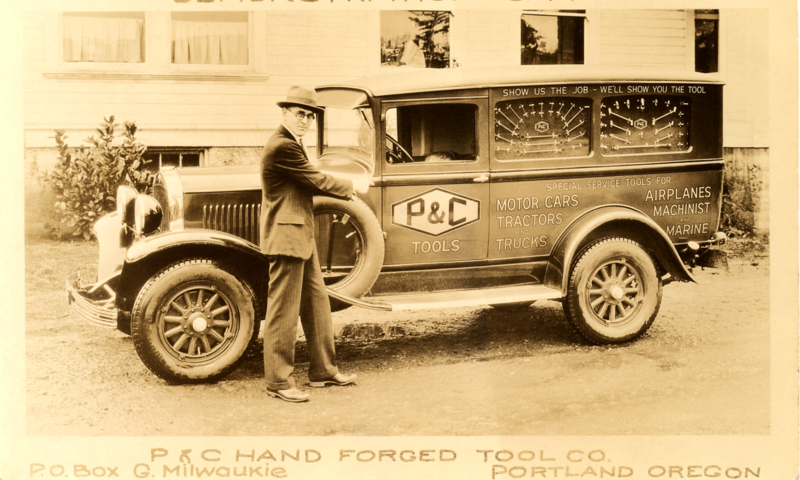 Welcome to those searching for historical information about P&C Hand Forged Tools! The firm of Peterson and Carlborg emerged in McCall, Idaho around 1915, and eventually found a permanent location in 1923 with the start of construction on the factory in Milwaukie, Oregon, just south of Portland. The factory was the realized dream of John N. Peterson and Charles F. Carlborg. This website chronicles their story. We were both tool makers and learned our tool-making trade from our fathers in Sweden, who were also tool makers. Naturally, when we couldn’t buy the kind of tools we wanted, we made them ourselves out of the toughest steel obtainable, by a process of hand forging and tempering which we learned in the old country. It’s a story reflecting the dreams and struggles of two immigrants from Sweden. The American dream so many aspired to when they undertook the frightening journey to a new culture, language and geography with but a few dollars in their pockets. A generation of sturdy men, independent for the want of financial resources. If a house needed built, they built it. If something needed repair, they fixed it. If they needed a specialty tool, they made it. John and Charlie were at their cores, blue-collar men. Blue-collar men making tools for other blue-collar men are ideal tool makers. Deep down in their bones, John and Charlie were “makers” and “fixers”, roles they returned to after their years of establishing P&C were over. This website is dedicated to the “makers” and “fixers” like John and Charlie who built our country. Built to be somewhat interactive, the careful reader of this website will notice tiny endnote superscript numbers scattered throughout the text. Clicking on an endnote number will open the endnote page in a new browser tab. Clicking on a particular endnote link will open a picture or pdf file of documentation. This project seemed simple enough at the beginning. Like a surfacing Kraken, however, it quickly grew faster than anticipated. The author wishes to thank all who pushed and contributed; all my family members, Timothy Peterson, Troy Dietz, Keith Rumgay (both of them! ), the Milwaukie Historical Society, Steve Bird, Garin Baker, Garage Gazette, Papa’s Wrench and Garage Journal guys (jabberwoki for all your help and encouragement), Robin, Jim and Gary at the Cascade Pacific Plymouth Club, and others. This project was absolutely a joint effort. Thanks to all of you, and most importantly to God who has blessed me far more abundantly than I deserve.